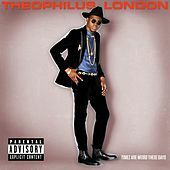 Theophilus London has come a long way since his mixtape work with glitch-hop producer Machinedrum. On his major-label debut, the New York rapper/vocalist recruits Sara Quin of Tegan & Sara for backing vocals on "Why Even Try," while TV on the Radio's David Andrew Sitek, among others, contribute production. London adopts a vocal tone eerily similar to Kid Cudi for most of this excursion into hip and fashionable neo-wave, resulting in '80s-inflected highlights like "Love Is Real," "Stop It" and "Last Name London."